Best place to be in la serena! 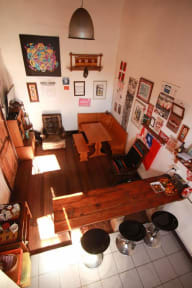 Small hostel with a familiar atmosphere. Nice latenight talks with the other guests and staff with vino and music! 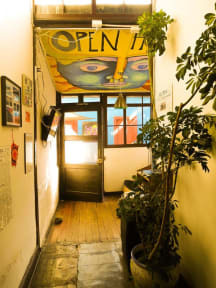 We felt like home and would defently recommend this hostel. Perfect location right next to the plaza! The hostel itself was nice, but it was so so cold bc of the high ceilings! Gute Lage im Zentrum, nettes Hostel mit nur 12 Betten. Das Badezimmer ist schmuddelig, keine Geschlechtertrennung. Showers were definitely not hot and breakfast consisted of a small bread roll and jam (as usual). The place was calm and the beds comfortable though. Die Betten waren bequem, sind aber noch in Folie eingepackt und knistern daher. Locker sind vorhanden, Frühstück ist dürftig.